A hardbound presentation of arithmetic from an adult’s viewpoint. Calculators are not ignored, nor are they emphasized. Calculations with decimal fractions precede manipulations with common fractions. Each section begins with a pretest to enable the user to focus only on needed material. A worktext for college students that provides a foundation in basic arithmetic from an adult’s viewpoint. It assumes no prior background in mathematics. Each chapter begins with a pretest and a list of specific objectives and concludes with a self-study test. 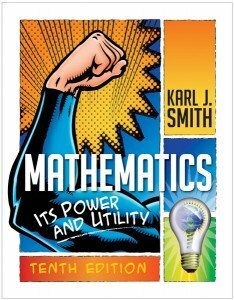 Mathematics: Its Power and Utility, 10th Ed. Help your students build confidence, problem-solving skills, and math literacy. This effective book provides a proven framework for carefully guiding even the most math-anxious student.